First, I just want to take a moment to send love to Jennifer Perillo of In Jennie’s Kitchen who lost her husband Mikey this past week, and Kristen Doyle of Dine & Dish, who lost her brother after his struggle with cancer. I can’t begin to imagine the unthinkable heartbreak each woman is trying to navigate. I hope the huge wave of love their loss has inspired across the internet (have you seen the peanut butter pies? Mine’s coming next week) is just one tangible way God is embracing them during this time. These tragedies come in the same year that Mara (I Made Dinner) lost her father and father-in-law and Erika (Ivory Hut) lost her home in a fire. This has been a hard year for so many blogger friends. The whole blogging community is grieving with and praying for these ladies, who deserve every ounce of the outpouring they’re receiving — and more. May God bless and keep you during your hard times. I sat in a coffee shop last night with a friend chatting about submarines (what?) and drinking Pomegranate Hibiscus Ginger Ale. It was unfiltered, and the ginger burned my throat with spice every time I took a sip. The burning reminded me of eating rum cake, each bite of which is literally heartwarming. I love that sensation. The ginger prickle in my throat also reminded me of pickled grapes. 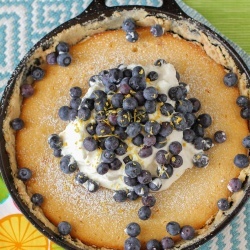 This intriguing recipe boasts a surprising flavor combination. I know the words “pickled grapes” may initially conjure up visions of dilly, sour grapes and the urge to upchuck one’s lunch (can I say that kind of thing on a food blog? ), but hear me out. As Deb said in the original recipe, these are a desserty sort of pickle. 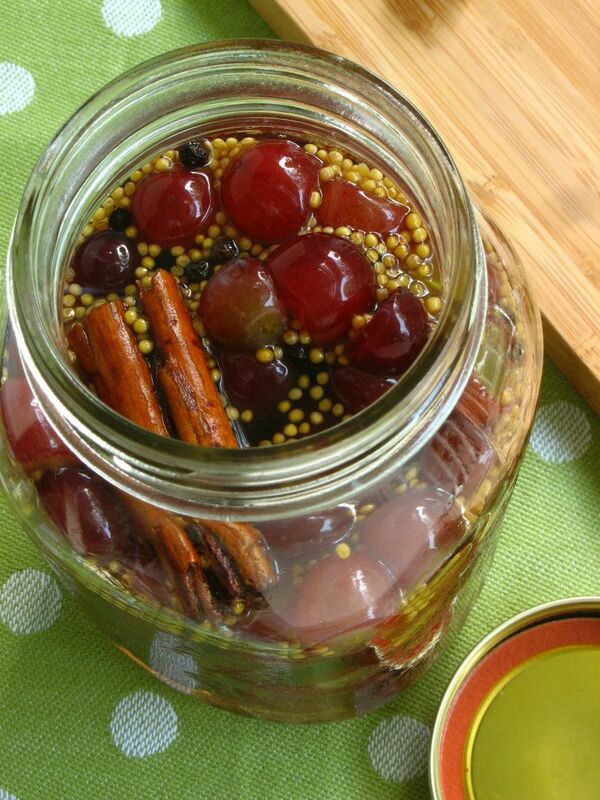 The brine itself is spicy with peppercorns, mustard seed, and cinnamon, and the grapes take on a deep, sweet warmth that the vinegar doesn’t overpower. 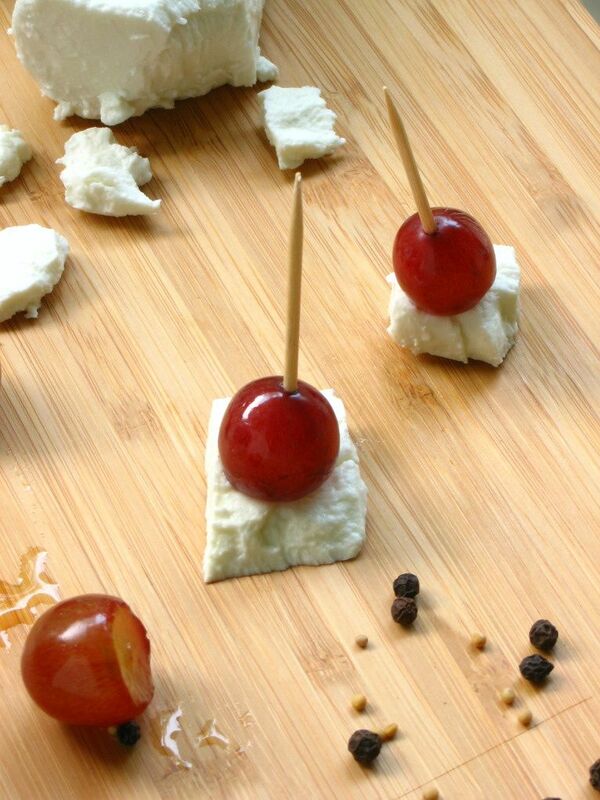 I served these in a little dish with wells for the grapes, goat cheese hunks, and toothpicks. 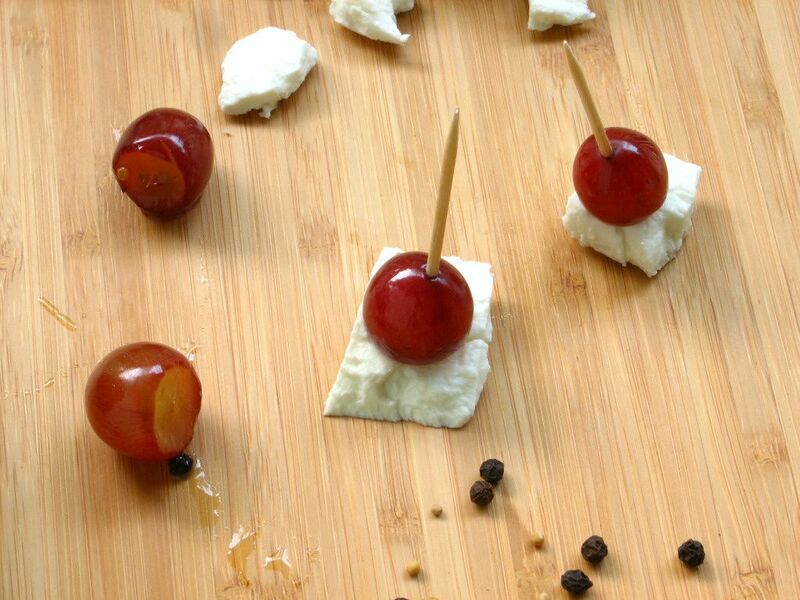 Friends at my elementary school throwback picnic would grab a toothpick, skewer a grape, skewer a cheese hunk (that sounds like the kind of guy I want to meet — a cheese hunk. ha ha), and devour. 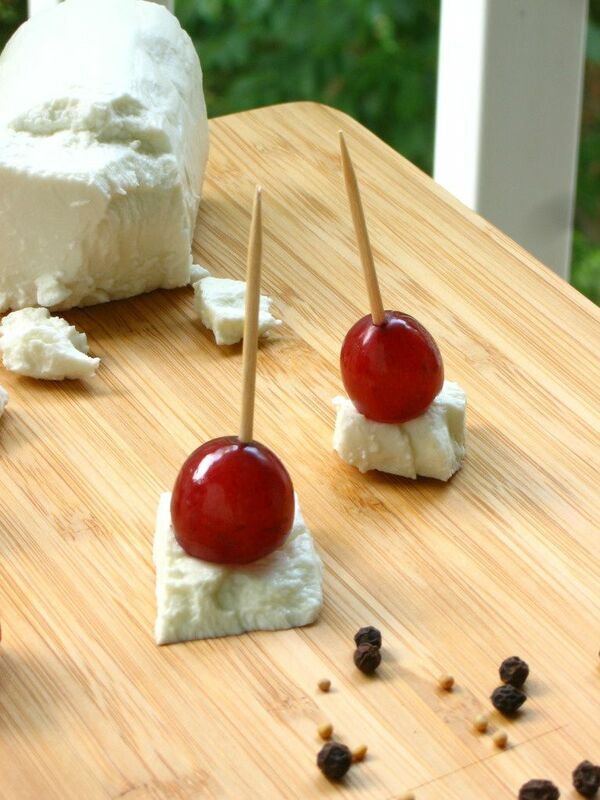 Pairing the grapes with creamy goat cheese grounded their tangy flavor and, for me, made them the perfect appetizer. As you might expect, these meet mixed reviews. I have a friend who tried the recipe with green grapes and didn’t love them. Some folks can’t get past the idea of a pickled fruit. But I really enjoyed the ease of preparation, their convenience as an appetizer, and the taste! If you like trying new things and have an open mind (and palette), give ’em a shot! What kinds of things do you pickle? Cut off the very end of each grape, exposing a bit of the inner flesh (which will help the pickling solution infiltrate the grapes). Place the grapes in a clean mason jar. Bring the remaining ingredients to a boil in a saucepan over medium heat. Either pour the hot brine over the grapes and let them cool together or let the brine cool and then pour it over the grapes (Deb notes the difference: “The original recipe has you pour the bring mixture over the grapes and let them cool together. I personally prefer a cold brine on certain foods, not wanting to wilt the fresh fruit, so I cool the brine completely before pouring it over. The former will yield a more tender pickle, and it will pick up the brine’s flavor faster. The latter will take a bit longer to souse, but the grapes will stay more firm.”) I chose to mostly cool my brine first. 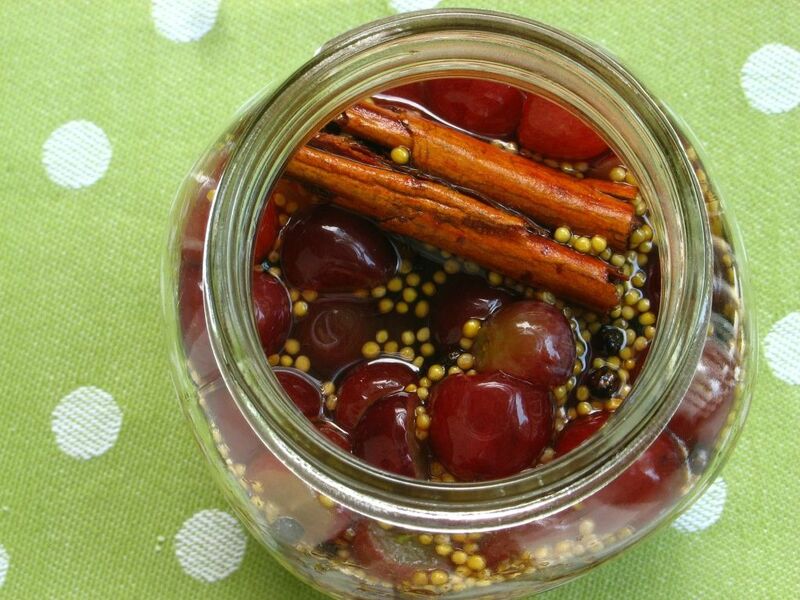 Once your grapes and brine are cool, chill in the jar for at least 8 hours or overnight. 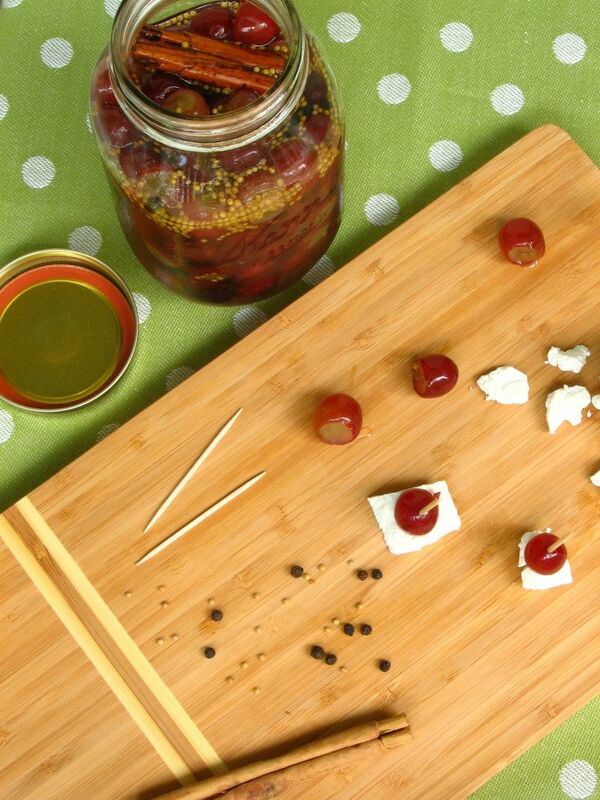 Serve cold with hunks of goat cheese. « Celebrating Cupcakes — and a challenge for you! Lovely shots of the pickle jar. Looks tempting! Ok, my first reaction on reading the title …ehh? But then I was like sure I’ll read because I like your writing even if the recipe is not one I’ll likely try. But actually, this intrigues me. And goat cheese is yummy! I wrote something a little while back about why cucumbers were so special they got to be known as pickles and not other things? hee hee. I’ve had pickled peaches before. Those were pretty good. Very interesting They are too pretty not too give them a try! I love this…I just bet it’s a great bite! How long does it stay good in the fridge? Looks lovely. Thanks, Diana! I’m not sure but I’d say at least a week or two! Hope you’re doing well, my little G6. Ooh, interesting! Pickled figs sound like they’d be similar and delicious. Hope you love these! This is a recipe that you can’t imagine how in the world it would taste. For that very reason, I just have to try it. I’m not sure my 91 year old mother will find it thrilling, or my southern born husband will jump for joy and beg for more….but me….I’m a bit of a rebel and I’m dying to know how these taste. 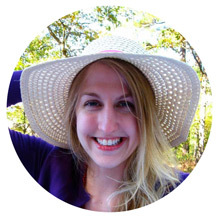 New to your blog and lovin’ it so far. I’ll let you know how it turns out. Also, making the coconut cake for my boss’ birthday tomorrow. That’s actually what brought me here. These look great! Is it necessary to use sugar for the pickling? Or can I sub with a sugar substitute like xylitol or stevia?